On March 11, 2018, over 7 million Cubans went to the polls to elect a new National Assembly of People’s Power. 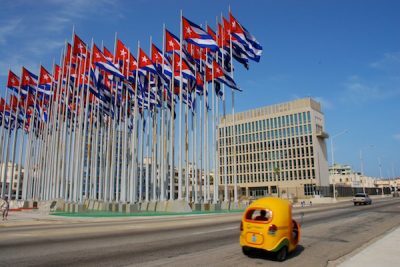 The election of the National Assembly is one step in the process which will culminate in mid-April with the vote by the National Assembly for the country’s new State Council, and soon after, they will elect Cuba’s new President. Two distinguished Cubans embarked on a tour of nine Canadian cities in late march and early April of 2018 to help break down the mechanics of the Cuban democratic system and address related questions from audiences nationwide. This event was organized by the Canadian Network on Cuba and various partner organizations across Canada. JUAN CARLOS RODRÍGUEZ DÍAZ is a Member of Cuba’s National Assembly of People’s Power, a Historian of the City of Pinar del Rio and Professor at the Hermanos Saíz Montes de Oca University. His translator is YAMIL MARTÍNEZ MARRERO, Director of the Canada Desk of the Cuban Institute of Friendship with the Peoples. Michael Welch of Global Research TV had a chance to interview the visiting dignitaries during the Winnipeg leg of the tour. The video was recorded and prepared by Winnipeg-based community videographer Paul S. Graham.